If you would like to follow along, the source code for this article is available on GitHub.com. There is also an online demo application if you'd like to play around with what we're going to build here. "Learn how to use Aurelia to build a movie listing application with ease." The only thing you need to follow along with this article is Node 4.x or above, which is the minimum requirement for the Aurelia CLI. Let's begin by creating our application using the Aurelia CLI. 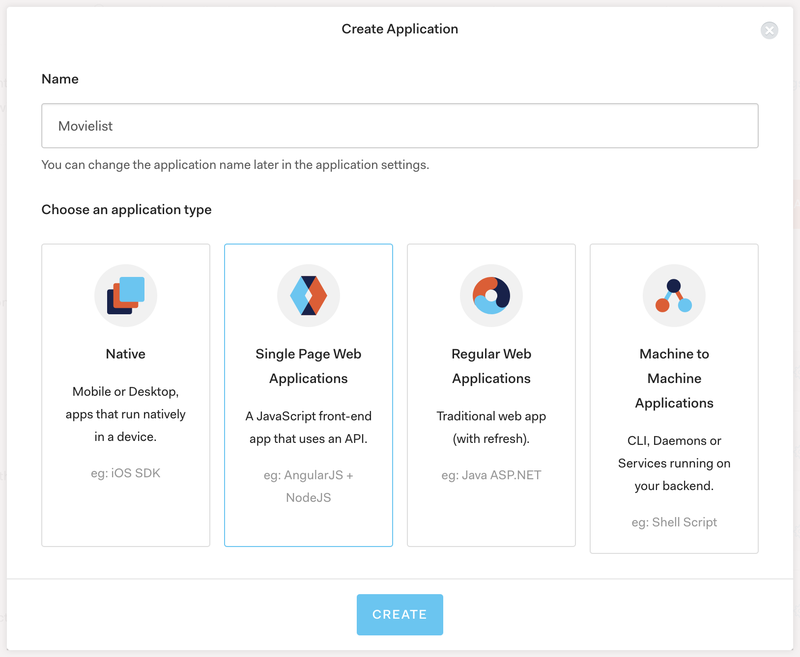 This tool will help us to set up a boilerplate application using sensible defaults (chosen by us), giving us a large head start in getting our application up and running. We won't have to worry about the detail of how it is configured — we'll be able to just start writing our app. The CLI tool will then guide you through the creation of your application. The first question asks you for the name of your application. I called mine 'movielist', but you can call it whatever you want. The next question, however, asks you for a choice of default setup — choose '2. Default TypeScript' here, as that's what we'll be using in this article. This will provide you with a sensible configuration for a TypeScript application that is built using Webpack. Next, you'll just be asked to confirm your choices, so go ahead and choose "1. Yes" to create the project. Finally, you'll be asked if you want to install the project dependencies. This simply performs an npm install operation on the project directory and installs all the packages it needs, so select 'yes' for this option. Once Aurelia has finished installing all of your dependencies, you should be left with a fully working application. Just to check that it's working, move into your project directory from the terminal (cd movielist) and then run the project using au run --watch. After a few seconds, Webpack should report that it has compiled successfully and you will able to view your newly created project by visiting http://localhost:8080 in a browser window. Hopefully, you will see the words 'Hello world!' printed out in a heading tag. If not, go back over the steps in this section and ensure that nothing has been missed out. Note: I would like to point out at this point that while you can run your project by simply using au run (without the --watch flag) there is an open Webpack bug at the time of writing which prevents this from working properly. So for the purposes of this article, always run your project using au run --watch to make sure that it compiles and starts properly! At this point, you can open the project in your favorite editor. I'm using Visual Studio Code; while it's generally pretty awesome as an editor, it's particularly great at working with TypeScript and is a perfect fit for this project. At its core though, it has all the files you'd expect for a Node/Webpack project; there is a package.json file to manage dependencies, and a webpack.config.js file to configure your build. The build configuration is one of the more advanced ones you'll come across — we only need to make a very minor change to it as part of this tutorial — but it can be changed if you so wish. One thing I would like you to do is remove the test folder. While I'm an avid fan of unit testing, it's not something we'll cover as part of this tutorial. Therefore, if you don't remove this folder, you'll find that as you progress through the article, you will hit more and more issues with your unit tests failing as they run automatically whenever Webpack is invoked. Before we get started on the meat of the application build, let's have a quick look at the API that is going to drive the whole project. The Movie DB is a huge database of information about movies and TV shows where you can retrieve names, overviews, ratings, cast and poster images. You can also get collections of popular movies and TV shows, some of which we'll be using here. We won't quite need it yet, but keep a mental note of where to get this key from later when we start putting in the classes we need in order to communicate with the API. Let's get writing our app. The first thing we're going to do is configure the main application window with some default styles and get the header into place. From this point, make sure you've got the project running using au run --watch and that you are able to view the application in the browser at http://localhost:8080. Looking in the src folder, you'll see the app.ts and app.html files. This is essentially the entry point to our application and is where the rest of our application will grow from. To start with, let's create our first component — the header. You will be asked which subfolder you want the component to be created in. You can just press 'enter' if you want the component to be created inside the src folder, but I'm going to create components such as this inside a subfolder called 'components', just to keep them nice and organized. Now if you look inside the src/components folder, you'll find header.html and header.ts. These are the files that make up our header component. Every component is created with some default 'Hello world' content, but we're going to strip that out and replace it with our own markup. You can see from this example how easy the binding can be between variables that exist on the component class and the template. Not only that, but changes to that variable will also be picked up and surfaced to the template in real time. Notice that we've also included script tags for Bootstrap and jQuery so that the responsive navigation bar works correctly across smaller devices. By the way, for my application, I've chosen to use the Darkly theme, but you can use any of the themes that you like, as all of the markup should be compatible. Let's begin with the API class. This will simply be a class that will allow us easy access to The Movie DB API and will wrap a node library called moviedb-promise. Create a new folder called api inside the src folder, and create a new file in there called index.ts. We also need a couple of supporting elements before we go ahead and create the API class itself. Note: After requesting an API key, The Movie DB team will generate two keys: one called API Key (v3 auth) and one called API Read Access Token (v4 auth). Use the v3 one to replace <your API key here> in the code snippet above. Next, we need to add some TypeScript typings for the moviedb-promise library that we're about to interact with. We don't have to do this, but it will make working with the library much nicer, seeing as we're using TypeScript anyway. This isn't an exhaustive set of operations that the library supports, but it does contain all the types and functions that we're going to need to build this app. Turning our attention back to the API class we're creating, open src/api/index.ts and start by importing the types that we'll need. Next, we can create the MovieDB client and load its configuration. The configuration is another API call to the MovieDB API that returns some useful settings to us, the main one being the secure (HTTPS) base URL to movie poster images! You'll notice that it also filters out movies that don't have a value for poster_path, so there's no point in prepending the full URL if we can't show the image anyway. That completes the API class — let's move on to showing some movies! We'll begin by showing the most popular movies on the home page. Later, once we've got the 'watch list' implemented, we'll shuffle things around a bit to be more like the final version of the application. For this, we'll need two components: one to show a single movie, and another to show a collection of movies together. Note: If the command above ends up with an error saying TypeError [ERR_INVALID_ARG_TYPE]: The "path" argument must be of type string, you might need to remove the current jest-cli dependency and installing the latest version available (for the time being, v23.1.0). Here we bring in a couple of types that we need: bindable allows us to create properties on our exported class that can be bound by components higher up the order, effectively allowing them to set which movie this component should display. We've also added a couple of methods that allow us to tell whether or not the mouse is hovering over the component or not. This is so that we can include some nifty CSS which will show the movie description on hover (check out the demo application if you haven't already, as it will become more clear). This is pretty standard markup for Bootstrap's Card component. For now, it mostly uses Aurelia's binding syntax for outputting properties of the movie into the HTML template. Notice the events which handle the mouseover and mouseout are used here to set an active class on the element that contains the movie poster and overview text. The idea is that, as you mouse over the poster, the overview text will come into view. This sets up an overlay over the movie poster image with a black background, with its opacity set to 0 (fully transparent). When the active class is applied, then the overlay becomes partially opaque. The idea is that the mouse events we applied in the previous step will apply this active class to the element, giving us the reveal effect allowing the user to read the overview text. Notice that there's also a transition setting, giving the overlay a nice fade—in fade—out effect whenever the class is applied. At this stage, it's a pretty simple component that provides bindings for some movies (the ones we want to show in the list) as well as a title. We're providing the movies binding because we're going to be using this component to display a list of movies from a bunch of different sources — the search result, the popular movies and the watch list. All of these things are essentially just different lists of the same Movie type, so it makes sense to reuse this component as much as possible. Thanks to the repeat.for directive, this template will loop through the list of movies that have been bound to this component. From here we simply show the movie component that we created in the previous step, binding the model property to the movie instance that we currently have in the loop. Around that is just some Bootstrap markup to display all the movies in a nice column format. There are a few things to note here. First of all, we're bringing in the MovieApi type that we created a while back, and it's being injected into the component by Aurelia's dependency injection framework. The @autoinject decorator allows Aurelia to automatically resolve the type and give us the right thing when the component is created. Next, we're handling the attached method, which is part of Aurelia's component life—cycle. attached is called once the component has been attached to the DOM. At this point, we call into the API to retrieve the popular movies. this.api.popularMovies() is a promise—based asynchronous method, which means we can take advantage of the async/await pattern and improve the readability of the code. This is a simple template that delegates most of its work to the MovieList component. Notice though that Aurelia has determined that the tag name for the component is movie-list — it has split the name based on the camel—case convention, making it a bit easier to read in the HTML. With any luck, you should now have the list of movies displayed inside your browser! Hover over the poster image and make sure you can see the movie overview text too, as that will show you that the mouse binding is working. In the next section we're going to be creating the user interface to allow the user to search for movies, so let's take this opportunity now to set up the Aurelia router to allow us to do that. The first task is to configure the router to enable pushState, which allows us to use proper URLs like /search instead of the usual /#/search type, which will be required later once we start receiving callbacks from Auth0. The other thing this function does is to set up a single route that points to our Popular Movies page by default. We'll come back and modify this later once we start adding the rest of the pages in. 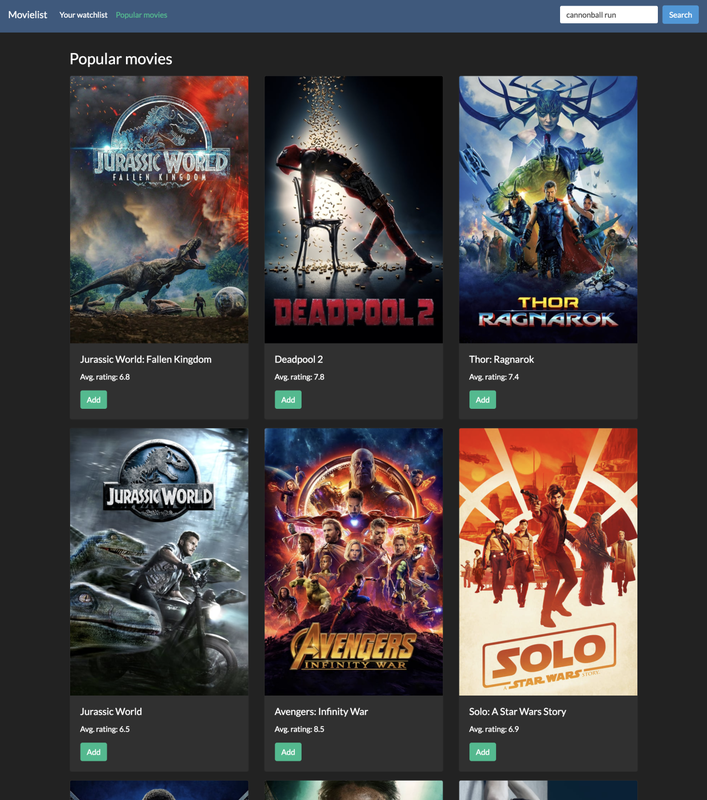 If you run the app now, you should still see the Popular Movies page, and you should be able to see that if you either browse to / or /popular you will see the same data. You will change this later in the tutorial. Now that we have the facility to browse between pages, let's go ahead and tackle 'search'. This page is going to be very similar to Popular Movies, in that it simply uses the MovieList component to display the results that have been retrieved from a call to the API. We'll also put a search box in the header, allowing the user to type in some search criteria. There are a couple of things to notice here. First is that we're just using the usual MovieList component to display the results and to bind the movies property to a list of results. We'll tackle where those results come from in a moment. And spinner.svg. This SVG file came from Sam Herbert's excellent collection of SVG loaders, and I used rings.svg in my implementation of the app. Pick which one you like from his SVG loader repository and save it alongside the spinner component as spinner.svg. Again we're using the autoinject decorator which allows the MovieApi type to be automatically injected into the constructor when this component is created. Then, we implement one method activate which is called by the Aurelia router when this component has been activated through a route. This function is given the search term as an argument, meaning that we can use that to query the API. Notice that this function uses the async/await pattern as well, meaning that we can write the call to the API in a way that appears to be synchronous, but actually it's using a Promise in the background. Finally, the content for the header is devised based on the number of search results that have been returned. If we get some results, the header tells us how many results there are for the given term. Otherwise, we simply display a message telling the user that there were no results. Here the route is configured so that the page can be accessed via the URL, including the search term. For example, we should now be able to find all the Godzilla movies by browsing to the search page at /search/godzilla! Notice that the form has submit.trigger="doSearch()" applied to it, which means that when the form is submitted (either the user hits the enter key after entering a search term, or presses the 'search' button) then it will execute the doSearch() function inside the component. Another thing of importance is that the textbox's value is bound to the searchTerm property so that we can retrieve the value that the user typed in when the form has been submitted. We'll see how this is created in the next piece of code. <pre><code>&lt;button class="navbar-toggler" type="button" data-toggle="collapse" data-target="#navbarSupportedContent" aria-controls="navbarSupportedContent"
Now the search box should appear inside the navigation panel, and the user should be able to type in a search term and have the results displayed on the page. Neat! This will give the template access to the router and the available navigation elements, enabling it to write out the navigation links. If you look at the page now in the browser, you should find that the 'Popular movies' navigation link is available. In the next section, we're going to be adding the facility to add movies to the watch list and displaying all of the movies on the watch list on the screen. However, we're going to make it so that the user has to be signed in for the 'add' button to become available. So, we're going to manage user authentication by using the Auth0 login page. To do this, you first need to sign up for a free Auth0 account if you don't already have one. Once you have created your account, you will have access to your account management page where you can add an application. Finally, click the 'Save changes' button at the bottom of the page to commit your changes. From this point, feel free to set up social connections. You can then enable them for your app in the Application options under the Connections tab. For mine, I've enabled 'GitHub' and 'Google'. Here we've set up quite a few things that we'll make use of in the next few code snippets, but the main thing about this code is the Auth0 WebAuth configuration. These values are mostly pulled from the configuration that we defined in the previous section, but make sure that the value for redirectUri matches the value that was given in the settings for your Auth0 application. The value for audience is calculated based on the domain. Notice that we've also pulled in Router so that we can send the user to the right place once they've logged in. Here we delegate most of the work to the auth0.authorize() call, which will redirect the user to the Auth0 login page. However, we also store the current route that the user is on so that once the user has logged in, we can redirect them back to the page that they were on when they hit the login button. Although we only have a couple of pages, remember that the user can search for movies so this will allow them to continue where they left off with their search. The call to auth0.parseHash() will allow the auth0-js library to process the token information sent to use from Auth0 in the return URL. We then take that information and create out auth session by storing those values in memory (the setSession() method is defined next). The rest of the code here deals with the loading of the previously saved URL and returning the user to where they left off. We also emit an event to any listeners to let them know that the authentication state has changed. After working out the expiry time, we simply store the token values for later use. To do this, we just check if this.accessToken has been defined. If it has, we also check that the current time is still within the calculated expiry time. Now that the AuthService class has been defined, we can start to use it in the next section. Configure the Aurelia router to accept the /callback URL and pass it on to this new callback component. Here is where we invoke the call to handleAuthentication() and where the auth session is created, completing the round—trip which enables the user to log into our application. This gives us everything we need to load, store, add and remove movies. The next thing we can do is create a new page which displays movies that are currently on the watch list. This will be very similar to the 'popular movies' and 'search results' pages; we're just changing where the movies come from. The main difference here compared to the other pages that we've done, is that there's a new panel on this screen which displays a short message on the screen when there are no movies in the watch list, and a prompt to try looking through the popular movies list. This is just a link to the 'popular movies' page, generated by the router. Otherwise, it pulls in the MovieList component and assigns the movies property to the value watchlist.get(), which is one of the methods that we created in the previous step. Here we bring in the WatchlistManager we created earlier using dependency injection, as well as the router. We set hasMovies to a value depending on whether or not there are any movies in the watch list (thus showing the "There's nothing here!" panel) and we also listen out for the movie:removed event from the watch list manager. This enables us to resurface the panel if the user were to remove the last movie on the watch list. Notice that we've set nav: true on the watch list route as well, which means if you reload the page now, you'll see both 'Watchlist' and 'Popular movies' appear in the navigation bar. Also, you should now see the panel letting you know that you haven't added anything to the watch list yet — let's fix that now! To start adding movies to the watch list, we need to revisit the Movie component and add some buttons on there. We're going to add two buttons — one for adding a movie if it's not already in the list, and one for removing the movie when it's already in the list. The 'add' button will invoke the addMovie() function, while the 'remove' button will invoke the removeMovie() function. If the user hasn't logged in yet, the 'Sign in' button will invoke the login process and redirect the user to Auth0 for authentication. The reason we would like to remove our change handler function from the event listener is that it could otherwise introduce a memory leak. To prevent this, we can remove our change listener function from the auth notifier whenever the component is detached from the system. With this code in place, you should now be able to sign in to your application using the Auth0 login page, add and remove movies to and from the watch list, and be able to browse to the watch list page and see the list of movies that you've added. Furthermore, you should be able to do this from either the popular movies page or the search results page! With this in place, you will be able to log out of the application and all of the 'Add' and 'Remove' buttons on each movie will update to reflect the change in auth state. "I just built a movie listing application with Aurelia." 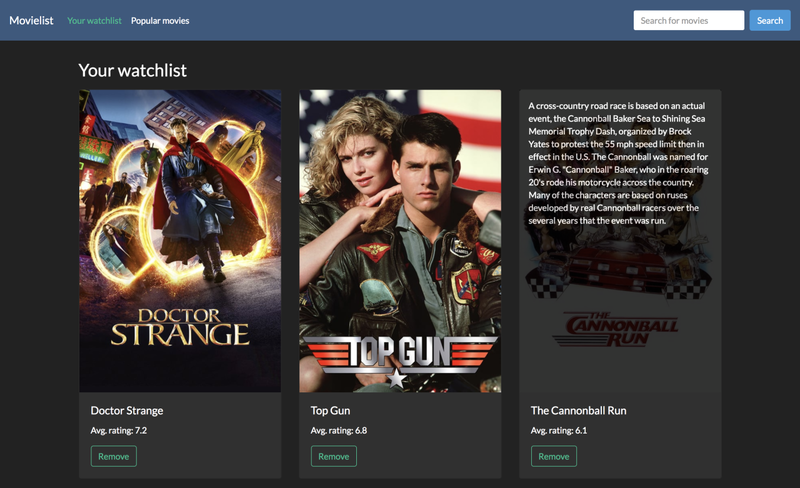 In this article, you saw how to create an Aurelia TypeScript application that allowed you to browse for popular movies or search for your own favorites. We saw how to create components using the CLI tool, how to bind variables between the component and the template, and how to use dependency injection and the autoinject decorator to bring in other types and create a loosely—coupled framework of code. The application could be further extended to support TV shows or could use the information retrieved from Auth0 to get profile-based information such as the user's email address or avatar for display somewhere, creating a profile of sorts. Instead of watch lists being stored in local storage, they could be stored inside a database enabling a user to 'share' a watch list with another user. All these are useful features that are left as an exercise for you, the reader, to have fun with.